How can you resist the opportunity to craft a tasty cocktail? Learning to mix great drinks is fun and it certainly is not difficult. If you're looking to dive deeper into the world of the bar - at home or as a pro - then a crash course in bartending is just what you need. Are you still pouring and stirring mixed drinks? Is your cocktail shaker hidden under an inch of dust? It's time to step up your drinking and learn how to properly mix a great drink like (ahem) an adult. With a few basic tools and a handful of tips and tricks, your next drinks can be better than any you've made before. It's understandable, making a cocktail from scratch can seem like too much trouble, even a waste of time. You might even be asking yourself if it's worth it. Is making a pizza from scratch worth the time? Absolutely! All of the joy and excitement you get out of cooking can be found in the bar as well - even if that bar is in your kitchen. Think of the flavor combinations you can create and new drinks you can explore. Picture the look on your friends' faces when you whip out your cocktail shaker. Imagine how much money you'll save when you can replace those $12 martinis at the bar. There are serious benefits to learning a few bartending skills and you'll have a ton of fun at the same time. It's not like we're asking you to chop onions here! Booze, fruit, maybe a little chocolate, how can you say 'no' to that? Mixing a great drink has a certain satisfaction to it as well, it's an accomplishment to be proud of and a skill set that you can share with others. Don't keep it to yourself, invite some friends over and enjoy the process together. As you go through this bartending guide, take in as much as you like at a time. Come back to review something or to study a topic a bit further. It's a crash course in mixing drinks and there is a lot of information to take in. Pace yourself so it doesn't seem overwhelming. If you keep at it and discover the joy that is mixing up a great drink, you'll be hooked. Nothing beats a fresh drink and anyone can pull it off. Trust us. As you begin to explore the bar, you will come across a specialized vocabulary of words and phrases. Some of these are common sense and others may not be exactly what they seem, so a little explanation is necessary. As we continue with this course in bartending, we will look at other definitions. Let's begin, however, with a few basics as well as the lingo that warrants only a quick mention. Is it a Cocktail or a Mixed Drink? Every drink that you mix up in the bar is a mixed drink. That's pretty clear because you are 'mixing a drink,' right? While the words 'mixed drink' and 'cocktail' are often interchanged, the two do not have the same exact meaning. A mixed drink is any beverage that combines two or more ingredients. These drinks are often simply poured over ice, for example, a John Collins or a Rum and Coke. Though we often assume that a mixed drink contains alcohol, this is not always the case. Popular non-alcoholic drinks (aka mocktails) like the Shirley Temple and Arnold Palmer are technically mixed drinks as well. A cocktail is a mixed drink that is traditionally defined as a combination of liquor(s), a sweetener, bitters, and water (diluted ice). By this definition, a Brandy Cocktail is a pure and classic example of a cocktail, but we also consider the Martini a cocktail even though it contains no sweetener. And so, the actual, modern definition of a cocktail is broader than it was in the first days of the bar. In general, we consider cocktails to be many of the fancier mixed drinks that require a little more work to construct. It's a subjective definition and one that you shouldn't worry too much about. To sum it up: a cocktail is a mixed drink, but a mixed drink may not always be considered a cocktail. As you explore cocktail recipes, you will encounter these terms quite often. The exact measurement of either a dash or a splash is not important. Technically, a dash is 1/32 of an ounce, but who's going to take the time to measure that? A dash is typically smaller than a splash and used for ingredients like bitters that have strong flavors. Garnish - Often a fruit such as a cherry or an orange slice, a garnish is used to adorn a drink and add to its visual appeal. Some garnishes also bring in hints of flavor. Whether you just go to the bar for happy hour or are a professional bartender, it's good to know some lingo. Is it a Well or a Call Drink? - The well is a section in the bar where the 'house' liquors are stored and these are used most often by bartenders (they're the most economical and lead to a good profit). Well drinks are ones in which the patron doesn't specify a brand, so the bartender will pick up the whiskey, rum, or tequila from the well. On the flip side, if you call out a specific brand of liquor, you are ordering a call drink. For instance, you might order a Jack and Coke rather than a Whiskey and Coke. Is it Neat, Up, or Straight Up? - Ah, one of the great bar debates! These words are used to describe how a drink is served and they are often confused with one another. Brush up on the differences and you'll win the next argument over this one. On the Rocks - In the bar, 'rocks' refers to ice and that means that a drink served 'on the rocks' is served over ice. Simple stuff, but make sure your ice is fresh, it's the most underrated ingredient in the bar, but its importance cannot be discounted. Top-Shelf - When we talk about liquor, the term top-shelf is used to describe the best brands available. They are more expensive and (in theory) of a superior quality. The name comes from the placement of these bottles on liquor store shelves: the 'cheap stuff' is at the bottom and the 'good stuff' is on top. The Many Uses of 'Back' - People in the bar like to use the word 'back.' It can mean a few different things depending on how it's used. "I'll take a Manhattan with a water back." The Pickleback is a very popular shot served with a beer back. The 'backbar' commonly refers to the liquor stocked on a shelf behind the bartender. This is often where you will find the top-shelf distilled spirits on display, ready to be ordered in those call drinks. A 'bar back' is an employee of the bar that is in training to be a bartender. This is how many bartenders learn the business and the craft of mixing drinks. Consider this an apprenticeship in bartending, a job that is both rewarding and tough. Bar backs do many of the hard-lifting and mundane tasks to make sure the bartenders have everything they need. 'The Stick' - The word stick has two meanings as well. 'The Stick' is often used when talking about the bar itself. A bartender may say, 'I'm working behind the stick tonight.' This means that they're working a bartending shift. It's also common to call drinks that are muddled 'stick drinks' because the tool (the muddler) used to make them looks like a stick. Before you can mix drinks, you should have a basic understanding of the ingredients that go into them. Distilled spirits are the alcoholic beverages that we use most often in the bar. These include vodkas, whiskies, tequilas, etc. as well as all of the flavored liqueurs. As you begin to explore cocktails, you will be introduced to many distilled spirits. It is, first of all, important to understand the difference between a liquor and a liqueur. Again, we have a sort of double meaning here: all liqueurs are a type of liquor, but not all liquors are liqueurs. What is a Liquor? - Liquors are distilled spirits, meaning that a liquor is any alcoholic beverage that has been distilled. This includes the six base distilled spirits (vodka, gin, rum, etc.) as well as sweetened liqueurs. If it has gone through a still and comes out with a high alcohol content, it is a liquor. And a Liqueur? - Liqueurs, on the other hand, are sweetened distilled spirits. It is a subcategory of liquors and this is where many of our drinks get their signature flavors. 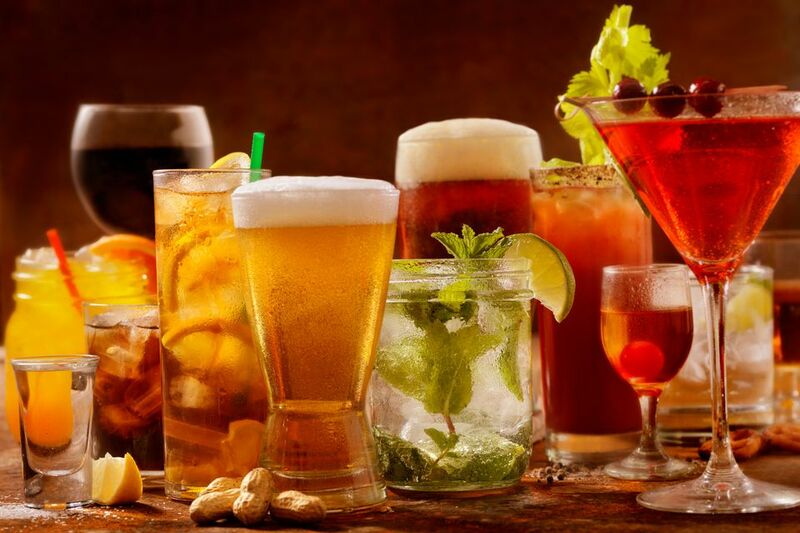 There are six types of liquor that you will use most often in the bar. These are often referred to as 'base distilled spirits' because they form the base for many mixed drinks and even act as the foundations for many liqueurs. Each type has its own primary characteristics, a few styles and variations, and many brands to choose from. Gin - Often distilled from grains, gin includes the flavorings of botanicals. Juniper is considered the trademark flavor. Rum - Made by distilling sugar or molasses, rum is a sweeter liquor and is produced throughout the world. Tequila - Strictly a product of Mexico, tequila is distilled from the agave plant and has a distinct earthy flavor. Vodka - The most used liquor, vodka can be distilled from any number of ingredients though grains and potato are most common. Whiskey - Whiskey is a complex category with a variety of styles though most begin with a distillate of grains. Whiskies are almost always aged unless it's moonshine. Liqueurs are just as vital to a well-stocked bar as the base spirits. These are the distilled spirits that give our drinks flavor. Liqueurs come in almost every flavor imaginable, from sweetened fruits to snappy spices and proprietary blends that are truly unique. Creme vs. Cream Liqueurs - As you explore liqueurs, you will come across many that use the word 'crème.' Contrary to popular belief, these are not creamy liqueurs even though crème does translate from French to mean cream. Liqueurs like crème de cassis (black currant) and crème de fraises (strawberry) tend to use more sugar than the average liqueur. They are more syrupy, but they are not creamy. Quite often, crème liqueurs use the French word for the flavor. For example, crème de banane (banana). Cream liqueurs, on the other hand, are those like Irish cream and RumChata that have a dairy base. These are actually creamy. There are a number of distilled spirits that do not fall into the category of the six basic liquors and they are also not liqueurs. Some do not even go through the distillation process, yet we rely on them in the bar. Some 'spirits' are simply unique and can be difficult to categorize. Among those are brand names like Veev Acai Spirit and Square One Botanical Spirit. Absinthe is unsweetened though it is often classified as a liqueur. Fortified wines like vermouth are not distilled but a small amount of distilled spirit is often added to 'fortify' an aromatized wine. We also have to consider aperitifs and digestifs like Campari, Cynar, and amaros. Many of these include a distilled spirit or are considered a liqueur, but this is not always the case. There are also many drinks that use beer or a style of wine. You now know the alcohol that can be poured into your drinks, but what about those mixers? While not a complete list, it's important that you look into these three ingredients because you will use them all the time. While you can get many great cocktail recipes from the internet, nothing beats a good book. There are a number of great bartending guides available that can kick off your bar library. Do you really need a cocktail shaker? If you want to stick with simple mixed drinks like the Gin & Tonic or White Russian, probably not. However, if you want to break free from that style of drink, then a cocktail shaker is vital. The biggest complaint about shaking cocktails is that it takes too much time. While it may take a minute or two longer, the quality of your drinks will be worth the effort. Shakers are relatively inexpensive and a good one will cover your cocktail needs for a lifetime. It's a worthy investment if you're really ready to step up your drinking game. While you are stocking your home bar, you might want to consider purchasing a few more tools. Even if your 'bar' doubles as the kitchen, you will find these very useful (some are helpful for food as well). How useful they are will depend on the types of drinks you enjoy most. They also make great gifts if you need ideas for your favorite bartender. At this point, you have the ingredients and you have the tools, now it's time to mix up a drink. Most cocktail recipes are self-explanatory -- shake it or stir it -- easy stuff, right? While bartending techniques are very easy, a few helpful hints will make your drinks just a little better. This section truly is 'Bartender 101' and the majority of drinks use one of these techniques. Shaken or Stirred? - That is the question, isn't it? In general, you will shake cocktails that have juices and other heavily-flavored ingredients. That means that you will stir drinks that are primarily made of liquor or those poured directly into a glass. How to Strain Cocktails - Whether you are shaking or stirring, in most cases you don't want to serve the same ice you mixed your drink with. The ice is broken down and will not last long, so straining is a necessary step for better drinks. How to 'Build' Drinks - Many of the easiest drinks (think of the Vodka Tonic) are 'built' directly in the glass they're served in. This is the simplest bartending technique and you've probably been doing it for years. To 'Top' a Drink - Quite often, a recipe will say 'top it off with soda.' While the ingredient can change, the idea is always the same: finish off the drink by filling the glass. How to Blend Cocktails - If you're a fan of frozen cocktails, then a few tips and tricks for working that blender will do wonders for improving your summertime favorites. If you'd like to dig a little deeper and mix drinks like a true professional, then you need to add these mixing techniques to your skill set. Each will require some practice, but they are relatively easy to master. How to Roll a Drink - Mix a drink by 'tossing' it from one vessel to another. How to Layer Cocktails - 'Float' ingredients on top of one another to create cool layers. How to Muddle Cocktails - Smashing drink ingredients to bring out their essence. From the Mojito to the Old-Fashioned, it's required for many of the best and freshest cocktails. The bar is filled with opportunities for anyone who enjoys a little DIY project. From homemade syrups and liqueurs to infusing new flavors into your distilled spirits, the possibilities here are endless. By making your own cocktail mixers, you will not only enjoy fresher ingredients, but you can save a lot of money. Plus, many of these recipes are just too easy to pass up. Why buy when you can DIY, right? Syrups are the easiest place to begin. If you have sugar, water, and a few ingredients to add flavor, then you can do this. There's really no skill involved either and most of these recipes should take less than 10 minutes of your time. Simple Syrup - It is called simple for a reason and once you learn the trick to this one you will never buy a bottle at the liquor store again. Simple syrup is used in many cocktails because it's sugar in a liquid form and that makes it's easier to mix with. It can also be flavored with little to no extra effort. Sour Mix - Also called 'sweet and sour' or 'bar mix,' this is essentially a simple syrup with lemon and/or lime juice added. It makes quick work of Margaritas and other tropical drinks and is very useful in the bar. Grenadine - Next up in importance is grenadine, the pomegranate-flavored syrup that's essential to a Tequila Sunrise and many other great cocktails. Again, very easy, your homemade grenadine will be ten times better than anything found in the store. Lime Cordial - A sweetened lime juice, lime cordial can be used in the popular Gimlet cocktail or even topped with soda for a quick, homemade lime soda. Gomme Syrup - In classic bartending guides, you will find many recipes that call for gomme (or gum) syrup. It is simple syrup that has gum arabic added and will give your drinks a silkier texture. Agave Nectar - Honestly, it's difficult to make your own agave nectar, yet it is an alternative to simple syrup and other sweeteners so it warrants mention here. In fact, you may enjoy it more than anything else, so pick up a bottle and mix it into your next drink to see for yourself. If you're feeling really crafty in the bar, you might want to make your own liqueurs. They're very easy though most do take some time, so plan ahead. Infusion Tips & Recipes - The easiest homemade spirits are infusions. Though flavored vodkas are the most common, you can add flavor to rum, tequila, whiskey, brandy, or gin, even some liqueurs. The technique is very easy and, depending on the flavor, it should be ready to drink in a week or two, if not sooner. Many ingredients we use in the bar can be made from scratch and some cocktail recipes actually require you to make a special ingredient. If you are ready for a true adventure in great drinks, learn how to make these ingredients. Cocktails are supposed to not only taste good, they should look good as well. Small things like choosing the right glass and garnish will step up the look of every cocktail you make. There is not a one-size-fits-all glass for drinks and different styles of drinks require different styles of glassware. You don't need to stock every style. Instead, you can base your decisions on the types of cocktails you like to mix up most often. Once you have the glasses, you will want to know how to properly prepare them for your cocktails. How to Chill a Glass - Every cold drink should go into a cold glass. It's that simple and taking the time for this simple step is one of the tricks to getting your cocktails to taste like a pro's. How to Rim a Glass - Do you enjoy a little salt with your Margarita? Whether it's sugar, salt, or some other flavoring, adding a custom rim to any glass is simple and enhances the experience. Garnishes should be little more than decoration for your drinks. At times, they can add a bit of flavor as well, but their primary purpose is ornamental. While you can skip the garnishes at home, it is a nice touch if you are entertaining, so it's a good idea to practice up. All of the basics of bartending have been addressed and now you want to go a little further, right? You may have a few unanswered questions and most of them likely have to do with the 'whys' of the bar. There are very good reasons why bartenders use certain tips and tricks and why we pay attention to particular aspects of mixing drinks. The theory of the bar is filled with seemingly random advice but it all serves a purpose: to make every drink just a little bit better. Advanced knowledge in bartending and the study of mixology is what sets great bartenders apart from the average drink slinger. This may get a little geeky, but that's what we're here for! Many people have the same questions about liquor and one of these articles may just answer yours. Mixed drinks are all about combining flavors and finding a perfect match to create one stunning drink. If you like to develop your own cocktail recipes and are looking for fresh ideas, these guides will help. You will also find many great recipes to use as inspiration. Alcohol is not a thing to be taken lightly and as much fun as we have with it, there is a certain level of responsibility that comes along with making drinks. The Order of the Pour: Does It Matter Which Ingredient Goes First?